Malt Bar South Park's special guest, a thin bespectacled man wearing a checked pattern shirt that was somehow both conservative and riotously colorful, was greeted by the owner as soon as he walked through the door. 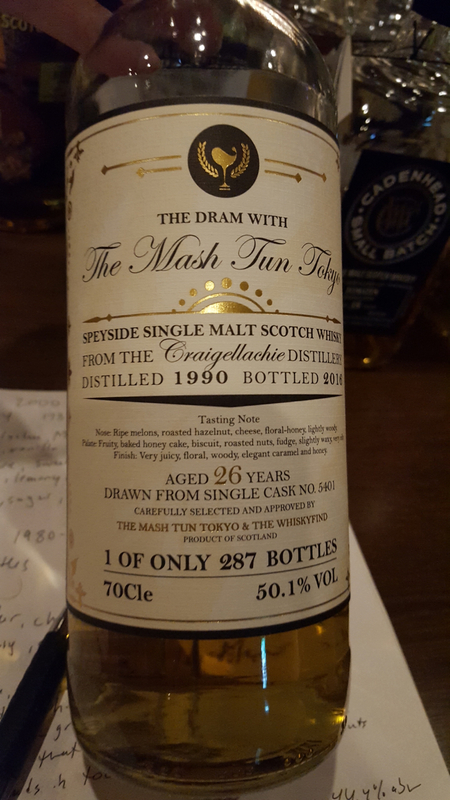 He gave the owner a bottle of whisky as a gift as they chatted in the right corner of the bar. After several minutes he came over and sat in his reserved seat next to me. We nodded to each other and I went back to nosing my glass of Tomatin. Once I'd emptied my glass, the bartender, Fujita-san, came over with the bottle of Ardmore I'd tried earlier. He pointed to the bottle and said, "Whiskyfind", referring to the independent bottler of the whisky. Then he gestured to the man next to me and said, "This is Whiskyfind". The guest nodded and laughed. And I replied, "So I guess you find whiskies." 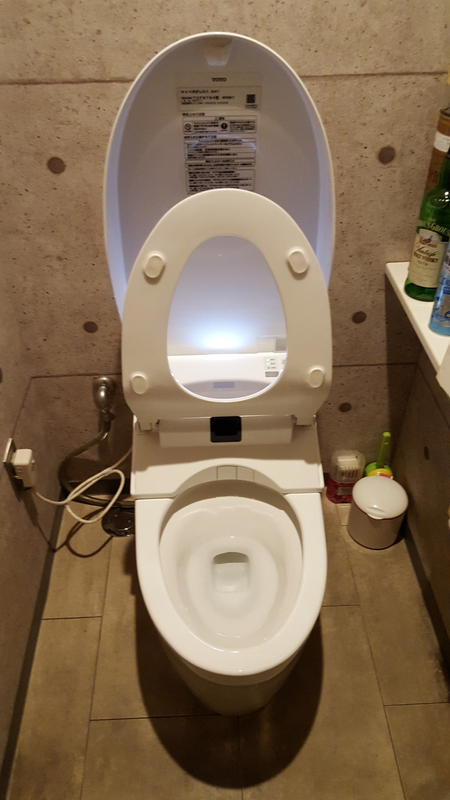 I felt like a robot toilet. 1. The man laughed politely. But then things got quiet. Even the bartender walked away. 2. It truly was my "Well, we're not in Kansas anymore" (of Swingers fame) line. 3. I said it LOUD and SLOW, as if he were deaf and mentally handicapped rather than being from another country. 4. Because the gentleman was of Asian background, I had assumed he was Japanese. His name was Odin Chou and, it turns out, he was not Japanese, but Taiwanese. And he spoke perfect English. To recover from my social fart, I turned to the one subject that whisky nerds can talk about. Whisky. We talked about Ardmore. Odin walked me through how his company works. I detailed the bizarro world of spirit sales in the USA. He asked, "Have you tried the Craigellachie?" I then tried the Craigellachie. Nose - Very nutty (hazelnuts, cashews, walnuts, almonds), peach, candle wax, lots of cereal notes and a whisper of caramel sauce. Palate - Malty malt. Lemons and limes. Salt and dunnage. Soft, silky texture. Finish - Candle wax and tangy citrus meet up with salty and savory notes. Words - This is the oldest non-sherried Craigellachie I've had, and it's the best. Excellent mouthfeel, complex nose. Again, no oak obstruction. Instead, the whisky imparts the gentle passing of time. 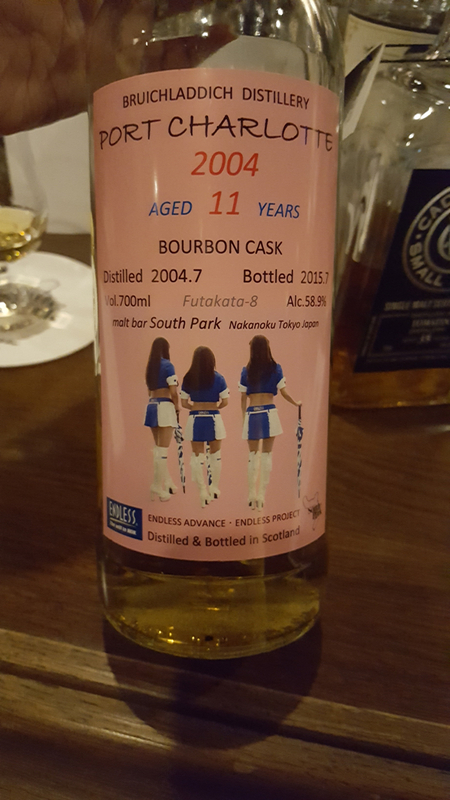 I suddenly remembered that Fujita-san had recommended a Port Charlotte to me on the first night, but I knew that I was d-o-n-e done after the pair of Ledaigs. I had promised to come back and try it. So there I was on my second night. It was time to give it a go. Nose - Very pretty for a Port Charlotte. Cocoa, roasted smoked almonds, anise, brown sugar, lime and confectioneries. Also grilled vegetables and bacon. Palate - Brown sugar, barbecue, sweet cherries and peat. A great bitter bite. Much less heat than expected. Finish - Peat, anise, cherries, brine and a wallop (or dollop) of horseradish. Words - Clean crisp PC with a more moderate level of peating than usual, so it's not a palate-killer like some PCs can be. Friendly good stuff. Odin then shared pours of a trio of 1989 Burnsides, as well as an Allied-era Ardbeg. (Thank you, Odin.) We discussed the high quality of the former and the delicate grace of the latter. Modern Ardbeg and Laphroaig are bereft of the fruits and subtleties of their old versions, and have replaced them with aggressive peat and/or oak levels. He was very generous with his time and we spoke for hours. He shared his extensive experiences with the whisky scene in mainland China, as well as his thoughts on the future of Suntory's single malts. I cautiously inquired about his opinion on Kavalan, and then burst out laughing when his opinion of that distillery matched mine precisely. Amidst this conversation, Malt Bar South Park's owner, Futakata-san (I think! ), brought over pours from his YAMAZAKI OWNER'S CASK. How many times can one man say arigato gozaimasu, before things get embarrassing? Whatever it is, I passed that quantity instantly. ...and that is when my pen died. My phone had already plotzed so nothing was recorded, anywhere. All I could do was be mindful and fully experience the moment. I did. And it was wonderful. I treasure these encounters. Writing about them refreshes me. The kindness and graciousness extended to me by strangers throughout my trip overwhelms me still and keeps me aglow in times of struggle and doubt.